A manufacturer from Torfaen is helping to dismantle the remains of the Chernobyl nuclear power station. A concrete and steel arch will cover the reactor which was destroyed in the 1986 disaster. Pontypool-based manufacturer Flamgard Calidair has developed fire and shut off dampers for the project, known as the Chernobyl New Safe Confinement. The £1.3bn (€1.5bn) building is set to be completed before Christmas 2017. The disaster happened in the early hours of 26 April 1986 when an experiment on cooling pumps in reactor four went wrong, causing it to dramatically overheat. The subsequent explosion inside the reactor core damaged the building, releasing six tonnes of nuclear debris into the atmosphere. A concrete tomb was built over the destroyed reactor core in the months immediately after the disaster. The new 108m (354ft)-tall structure, which will be the largest movable building in the world, will enable engineers to demolish the previous protective concrete shield and old buildings which still house highly radioactive material. It is thought it will be operational for at least 100 years. 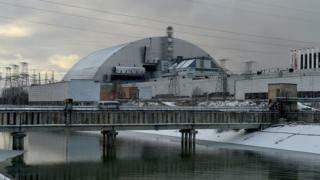 Flamgard's managing director Steve Edwards said: "The story of Chernobyl is one of history's most tragic. But while the neighbouring town of Pripyat is still an unoccupied ghost town exclusion zone, there is some hope for the future of the Chernobyl site with this project. "In engineering terms, there can be few live projects in the world right now that are as important and as ambitious as the new safe confinement. "It's not just a shell either, there are entry points, engineering areas and access to the site inside, designed to facilitate monitoring and demolition of the disaster site. This is where Flamgard's dampers come into play, protecting these rooms and ventilation zones/ducts to minimise the risk of damage should an incident such as a fire or further explosion occur." At least 4,000 people are known to have died from the disaster, although the number is thought to be much higher.